Robert Plomin is a legend. For over 40 years he has been on the forefront of our understanding of the genetic and environmental influences on human behavior. Based on his groundbreaking work on twins, he showed that genes really do have a substantial influence on our psychological traits-- we are not born a lump of clay. Plomin coined the phrase "non-shared environment," and he was ranked as the 71st most "eminent psychologists of the 20th century." When I taught a course on human intelligence at NYU, I repeatedly cited his research and quoted his measured language and caution surrounding the interpretation of his findings. Don't get me wrong: I am excited about the rapid progress scientists are making in using information about DNA to predict individual differences in intellectual functioning and personality. But I firmly believe we need to be more thoughtful in determining what relevance these rapidly emerging findings have for the actual individual human beings who are inhabited by the DNA. In this article, I will respond to 12 statements by Plomin that I have found particularly problematic. Note that these critiques are absolutely not personal; I can't stand ad-hominem argumentation. As far as I can tell, Plomin is a well-meaning guy. I recently had a (mostly*) enjoyable conversation with him for my podcast, in which he was very polite and generous with his time. Indeed, precisely because I have respected his research so much throughout my career, I have decided not to hold back any of my thoughts about what he has written. OK, here goes. This is the title and subtitle of his recent article for this very magazine. The juxtaposition here blew my mind. How can one say that nature wins and then in the very next sentence say that environmental influences are important too? Now, maybe it's just a catchy headline, and there will be some great nuance deeper into the article. Maybe he points out that of course there really isn't an actual war because nature and nurture are highly dependent on each other. Maybe he'll point out that his own research suggests that the forces of nature and nurture are actually quite balanced in their contribution to most human traits. So let's give Plomin the benefit of the doubt and dive deeper into the article. How could Robert Plomin of all people say such a thing? This is not what the shared environmental findings suggest, and most psychology professors go through great pains to emphasize this to their students in Psychology 101! What the evidence actually suggests is that families don't generally make siblings more similar to each other, or they only do to a small degree and only for specific traits. And to the degree that they do, those traits tend to diverge when children leave the home. Judith Rich Harris famously reviewed that evidence in her bestseller, The Nurture Assumption. "Take the most essential element: a child needs to be raised in a family, almost any kind of family, to develop the ability to speak a language. Since every single person in twin studies checks that box (i.e., is raised in a family of some sort), this factor never varies and thus does not predict differences in ability to speak a language. But does this mean that the variable "has a family" doesn't matter in determining whether or not a person develops the ability to speak a language? Of course not! That's like saying that water has no influence on a fish's development because all fish live in water. Just because a variable doesn't vary doesn't mean it has no causal impact on a particular outcome. The parenting factors that are statistically associated with differences between individuals should never be confused with the parenting factors that cause the development of a trait within an individual. Genes could "account for" 100% of the variability in a trait in a particular twin study, but this does not mean that environmental factors are therefore unimportant in the development of the trait; parents still matter and will always matter. It turns out that parenting matters, just in a way different than originally assumed. Genes matter to the extent that they support parenting because like any other behavior, parenting behaviors are influenced by the genes ”and parents matter to the extent that they support the expression of genes." Furthermore, for traits like IQ that are only about 50% heritable, even if there are no effects of the so-called "shared environment," parents may nonetheless be an important part of the so-called "non-shared environment," as long as the effects they have on their children tend to make them different from each other. This may seem counter-intuitive-- surely given that children in the same family have the same parents, then parents must be part of the shared environment-- but that is not true because of the technical meaning of "shared environment" in the models used to estimate heritability. Again, only forces that make children in the same family more similar to each other count as "shared environment," so the present state of scientific knowledge means that parents may be important in influencing their children to become more unique. Again, it's impossible to make this claim based on what we currently know about genetics. Not only that, but these two sentences contradict themselves. First he says we would be the same, but then in the very next sentence he says of course we wouldn't be the same. What he is basically saying in these two sentences is the following: "You would be the same person if you had been adopted at birth and raised in a different family if that family somehow was in exactly the same situation and experienced exactly the same environmental forces your entire life as the family you were adopted from." This seems pretty unlikely based on how the world works, and seems like a pointless comparison anyway. Plomin seems to think that because environmental influences are "largely unsystematic, unstable and idiosyncratic", that somehow they just don't happen. Or that they would happen in exactly the same way no matter where you lived. That is an inherently contradictory perspective. You couldn't possibly be the same person if you had been adopted at birth and raised in a different family even if the family itself had no influence (which is a false claim, anyway), precisely because of the real existence of all of these unsystematic effects! In other words, it's the existence of the very environmental effects that he acknowledges that invalidates his own claim. Additionally, it is simply not true that all influences of the environment are "unsystematic, unstable, and idiosyncratic," even if many of them are. As we'll return to below, research using natural experiments has shown that every year of education causes an increase of approximately 1 to 5 IQ points. And research on personality provides evidence that a number of life experiences-- including beginning one's first romantic relationship or starting one's first job-- have a systematic and lasting effect on personality traits. I've seen Plomin repeat this claim in multiple places, including in his book. But there's no evidence to suggest this is actually the case. While researchers initially found support for a "genetic set-point", advances in the types of studies used to examine such a claim (such as looking at extremely large samples that can capture a substantial amount of major life events as well as cross-cultural comparisons) have found that specific life circumstances are much more strongly associated with happiness and life satisfaction than once believed. As Ed Diener and his colleagues note in a recent review, "adaptation to life events and circumstances is not as inevitable as once thought. Although [well-being] is moderately stable over time, and although stable personality characteristics certainly play a role in people's happiness, life events and life circumstances also matter." Also, further research has shown that we can to a very significant extent override our genetic set-point through our conscious choices and life situations. In his article, Plomin also totally disregards the long-term impact of extreme experiences on the brain and cognition. Unfortunately, extreme adversity often leaves an indelible mark on our brains and cognition, and many people never do bounce back. Most of Plomin's research is on WEIRD populations (Western, educated, industrialized, rich and democratic). However, as one recent article headline aptly put it, "You can't characterize human nature if studies overlook 85 percent of people on Earth." In some of his other writings he includes the caveat that his findings probably don't apply in extreme circumstances, but he just happens to leave this essential caveat out of some of his other writings, including some of his writings, like this one, for a general audience. This is a serious omission considering that childhood maltreatment-- such as emotional and sexual abuse-- systematically sculpts our brain structure, function and connectivity, above and beyond the effects of our genes. In fact, maltreatment is a striking exception to the lack of share-environment effects reviewed above: maltreatment tends to make siblings more similar, which is why shared-environment effects are found for most forms of psychopathology. Now, there is one sense in which I agree with Plomin, and think he offers a hopeful message (indeed, he told me in our podcast chat that he views himself as a very optimistic person). Thankfully, most people do not experience extreme trauma in their lives, and the human capacity to thrive after trauma is remarkable. As resiliency researcher George Bonnanno wrote in his seminal 2004 article, "The vast majority of individuals exposed to [trauma] do not exhibit chronic symptom profiles and that many, and in some cases, the majority show the type of healthy functioning suggestive of the resilience trajectory. Those who cope well with violent or life-threatening events are often viewed in terms of extreme heroism. However justified, this practice tends to reinforce the misperception that only rare individuals with exceptional emotional strength are capable of resilience." It is certainly true that IQ is highly correlated with academic achievement. But Plomin's statement in this peer-reviewed article in Nature Reviews Genetics is misleading because there are other personal characteristics that are also highly predictive of academic achievement, including conscientiousness and intellectual curiosity. In some published findings, these characteristics have demonstrated just as strong a prediction of school performance as IQ. In fact, Plomin's co-author on this paper, Sophie von Stumm, has convincingly argued that a "hungry mind" should be the third pillar of academic performance, alongside intelligence and conscientiousness. I was very surprised not to see any mention of this finding in their paper. The effects of "non-cognitive skills" (which are truly poorly named, anyway) are especially predictive of curriculum mastery when you look at GPA and not merely scores on standardized achievement tests (which are basically IQ tests). 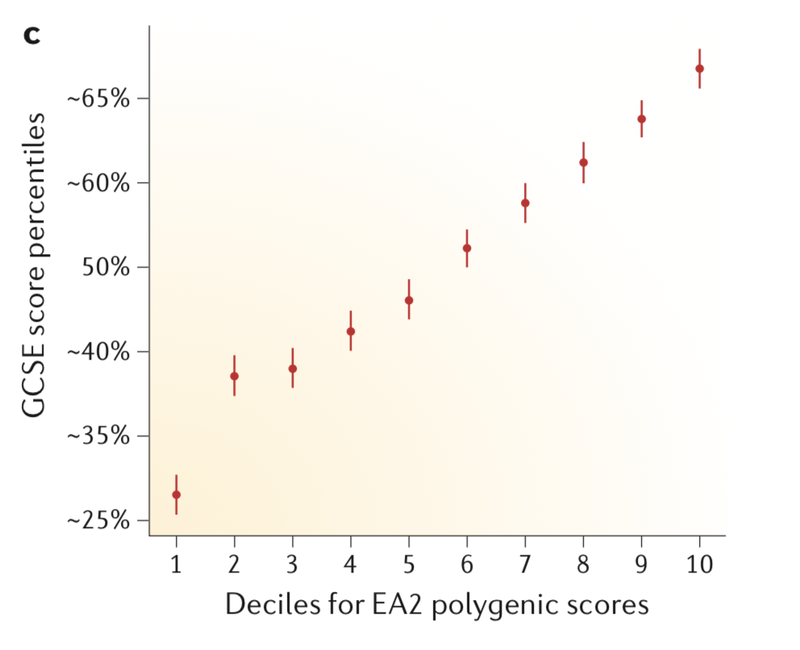 This graph clearly shows that if a person has a genome-wide polygenic score (GPS) at the 75% percentile, they could score anywhere between the 2nd percentile or the 98th percentile of academic achievement. Not very useful! 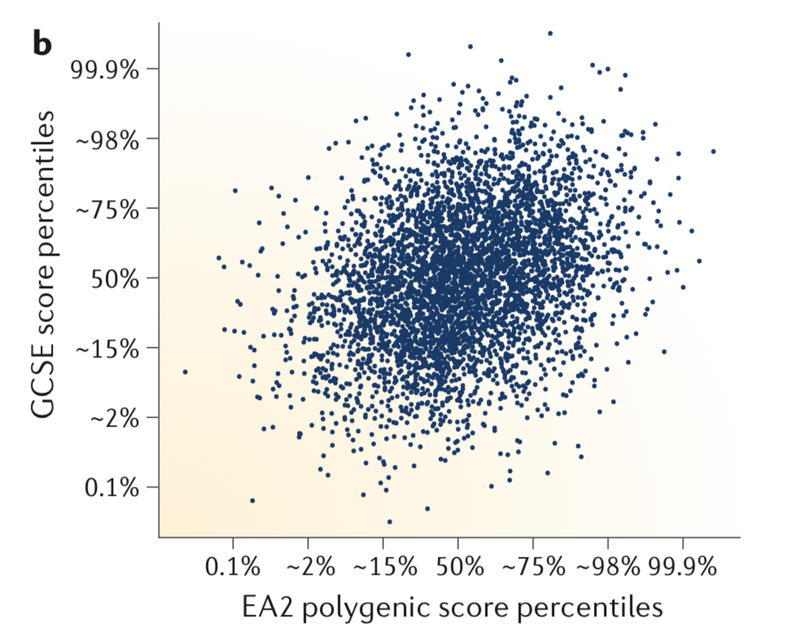 This is the case, even though overall there is a general trend for polygenic scores to be correlated with academic achievement scores. Knowing someone's GPS means that you'll do better when guessing someone's academic achievement than if you just flipped a coin -- but you'll still often be very wrong. "If GPSs for individuals do not change during the lifespan, a GPS derived from GWAS of intelligence in adulthood will predict adult intelligence just as well from DNA obtained at conception or birth as from DNA obtained in adulthood. By contrast, intelligence tests at birth cannot predict intelligence at age 18 years. At 2 years of age, infant intelligence tests predict less than 5% of the variance of intelligence in late adolescence." First of all, who in the world is administering IQ tests to infants at birth!? Those psychologists should be locked up. But more seriously, just because something is a better predictor of something does not make that thing practically useful. Let's say that someday science advances to the point where we are able to use genetic information at birth to predict about 10% of the differences in IQ among people in adulthood. Yes, that's quite a scientific feat and nerds should rightly rejoice! But that's still next to useless for predicting the trajectory of an individual's intellectual development. "A commonly chosen confidence interval [among a competent school psychologist] is 68 percent. Suppose you are trying to predict what an 11-year old child’s IQ score will be at the age of 21 and you know that there’s a .70 correlation in the general population between IQ measured at age 11 and IQ measured at age 21 (this correlation is at the upper end of what is typically found). Based solely on that information, what range of IQ scores can you expect he will obtain on his twenty-first birthday? Most contemporary IQ tests are a bit more reliable, but no test exists that is perfectly reliable. Even using the most reliable IQ tests available today, the expected spread is significant. Kevin McGrew reviewed IQ fluctuations among today’s most frequently administered IQ tests and estimated that the full range of expected IQ differences for most of the general population is 16 to 26 points." Forget precision. We're dealing with complex dynamic systems such as humans. What a misleading summary considering they just showed exactly how useless this information actually is for individual prediction! In reality, what they showed is that polygenic scores are so probabilistic that they probably aren't useful in predicting academic achievement scores for the purpose of making decisions that are important for individual people. I would argue this is particularly the case in a school-context, where schools shouldn't be as obsessed with keeping their averages up as they are with helping students to thrive and self-actualize based on where they are currently (more on that later). This is simply not true. Plomin is clearly familiar with the concept of "population stratification" considering he has controlled for this variable in his own research. The general idea of population stratification is that there can be confounds between the environment and any genetic differences that are discovered in a particular study. Having a correlation between a genetic score and an important outcome does not necessarily mean there is a direct cause from one to the other. For instance, if people who are related to each other differ systematically in their environments, it's not necessarily because of some causal force of the genetics on their environment. It could be due to historical influences specific to that group of individuals. Imagine in the United States you did a large genetics study of intelligence and you didn't control for race. You might find genetic differences that predict differences in intelligence, and they might correspond to actual differences in genetics. But you couldn't then conclude from that finding that black people are genetically inferior when it comes to intelligence, because there are all of these environmental conditions over the long term that have been specific to the black population, including, obviously, slavery and subsequent discrimination. This isn't me just being politically correct-- I am open to exploring the evidence and the implications wherever they lead. This is about actually caring about the truth. Behavioral geneticists try to deal with this potential confound by controlling for genetic scores for ancestry. But the fact is that you always have the problem that you can't necessarily control for all of the relevant historical influences. You don't always know what they are, and as psychologists we are perpetually surprised to discover new influences we didn't account for ahead of time. Especially with large samples, it's hard to be sure that just because you are controlling for something relevant it means that you are controlling for all of the relevant variance, even in the very thing you're attempting to control for! (See "Statistically Controlling for Confounding Construcsts Is Harder than You Think") As scientists, we need more intellectual humility in acknowledging the difficulties of accounting for stratification perfectly. Taken together, these two sentences pack quite the punch (the first sentence is the start of their paper and the second sentence is their closing sentence). Let's start with the first sentence: "Life is an intelligence test." There is a sense in which this is a sensible statement. Life does make demands on our cognitive ability, and being intelligent can help us sort out these demands successfully. However, based on Plomin's other statement, it seems as though this is not quite what he means by that opening statement. What is implied by "omnipotent" (which, according to the dictionary means "all-powerful") is that life is nothing but an intelligence test. Look, it is fine to talk about the importance of a single psychological factor as predictive and important-- and intelligence is predictive and important-- but what's the value of referring to that single factor as the "omnipotent variable" in life? It kinda depends on how a person chooses to live their life, no? For instance, IQ is most predictive of scientific achievement, but doesn't predict artistic creative achievement or more social domains of functioning, and for both academic and job performance conscientiousness is another powerful predictor, virtually unrelated to IQ. What's more, while IQ is moderately correlated with well-being in life, and the capacity to understand and manage your emotions is just as predictive of multiple aspects of well-being-- including self-acceptance, purpose, autonomy, personal growth, and positive relationships. Nowadays with social media and other alternative outlets, there are just so many ways people can self-actualize and live a life well lived that don't draw so heavily on the ability for on-the-spot cognitive abstraction and working memory functions (which is what IQ tests primarily measure). 11. "Schools matter, but they don't make a difference... This does not mean that the quality of teaching and support offered by schools is unimportant. It matters a lot for the quality of life for students, but it doesn't make a difference in their educational achievement." This is patently false. Analyses conducted on over 600,000, using natural experiments that rule out the effects of genetics, have found consistent evidence for beneficial effects of education on cognitive abilities-- approximately 1 to 5 IQ points for each additional year of education. Even if we take the lower bound of this range, after 10 years of education this compounds to an an increase of 2/3 of a standard deviation on IQ-- far from trivial I'd say. And that's just IQ. There are so many ways that educators make a difference in the lives of students, even at the individual differences level. Again, Plomin seems to think that just because many environmental factors are unsystematic-- and because he ignores those few like education that are systematic-- they somehow don't exist or are unimportant. But of course this doesn't follow. Educators make a very real difference in the same way that parents do-- by helping to draw out the best within their students (which is what the Latin root for education means anyway). Even if what's best within the student shows a substantial genetic influence, this by no means is the same thing as genetic destiny. All abilities and talents must be developed and expressed, and teachers serve an important function in helping the student to cultivate their greatest strengths. Giving enhanced resources to some students who are selected for gifted education makes a difference in the lives of those children and helps accelerate their learning (not to mention also creates further difference between them and the rest of the students in school). Likewise, supporting struggling students and helping to remediate their difficulties with compassion and research-backed interventions to get them back on track expressing their best self makes a real difference in those student's lives. I assume Plomin is trying to be cute with his distinction between "mattering" and "making a difference." What he is saying is that teachers "matter" in the sense that they have an effect on everyone, but they don't "make a difference" in the sense that they don't change the differences between people. There are two problems with this, however. First, nobody interprets "make a difference" this way, so it becomes virtually incomprehensible. Second, as discussed above, even sticking with his subtle meaning, it's simply not true that teachers don't make a difference. The fact remains that teachers make a difference because they matter, and they matter because they make a difference. "Rather then frenetic teaching in an attempt to make pupils pass the tests that will improve their standing in league tables, schools should be supportive places for children to spend more than a decade of their lives, places where they can learn basic skills like literacy and numeracy but also learn to enjoy learning." Here we are very much on common ground! However, one doesn't have to throw a teacher under the bus to make this point. In fact, this point shows just how much teachers can make a difference: they have the opportunity to stimulate learning and engage students in learning the material. This is perhaps the crux of my frustration with Plomin's rhetoric. In Plomin's worldview, intelligence is the "omnipotent variable" in life, and intelligence and broad personality traits are the only things that make us who we are. Each of us is simply a summation of our IQ + other broad psychological traits. I must say, this is not a worldview that is shared by me or most personality psychologists that I know. Dan MacAdams and Jennifer Pals put forward a wonderfully comprehensive set of "fundamental principles for an integrative science of personality." This framework, which serves as a guide for the field, conceives "personality as consisting of (a) an individual's unique variation on the general evolutionary design for human nature, expressed as developing patterns of (b) dispositional traits, (c) characteristic adaptations, and (d) self-defining narratives, complexly and differentially suited (e) in culture and social context." Of particular note here are characteristic adaptations, which include "motives, goals, plans, strivings, strategies, values, virtues, schemas, self-images, mental representations of significant others, developmental tasks, and many other aspects of human individuality that speak to motivational, social-cognitive, and developmental concerns." Sure, personality traits influence our characteristic adaptations, but so do our cultural context, life experiences, history of trauma, and the narratives we tell about ourselves and our experiences. Sure, we can use genetic information to help predict whether someone will develop high levels of a broad personality trait such as conscientiousness, but will they become a conscientious mob boss, accountant, or psychologist? Sure we could look at a person's genetic code at birth and estimate the probability that they will develop some of the characteristics of a psychopath (e.g., boldness, impulsivity, coldheartedness), but will they become a psychopath who kills people for sport, kills people for their country (military), or use their boldness for altruistic ends? Simply reading out a person's genetic information at birth will never fully capture the rich complexity and tapestry of an individual person's life trajectory, or completely strip a person of their unique wiggle room for making choices that steer their lives in a healthy direction. Systematic reviews of the personality literature show that while yes we each have a "biogenic nature," there is nothing sacrosanct about that aspect of ourselves. With enough intentional adjustments to our patterns over time-- whether it's through changing jobs, entering a long-term relationship, adopting a new identity, meditation, or certain forms of therapy-- people really can change who they are. Looking at our DNA is far from the "crystal ball" Plomin sometimes seems to think it is. Yet, he also seems to recognize that: "Genes are not destiny. You can change.... Heritability describes what is but does not predict what could be." What's frustrating is that there seems to be two different Plomins: (a) the careful, responsible scientist who did groundbreaking research in the field and provides the appropriate caveats, and (b) a publicly unleashed version of Plomin that says outrageous things that aren't even supported by his own research. I truly hope we can get back to the version of Plomin that inspired me in my own career and made me want to study human intelligence in the first place.